Concrete does not dry pretty and sometimes in different tones, too, depending on the mix and water content. But this did not matter in the past because it was used mainly as a base material. Nowadays, more and more people are getting interested in its utilitarian and contemporary look plus undeniable durability. While those totally embrace the imperfections of concrete, there are those who want to make it look more luxurious and vibrant. That’s what colored concrete is all about. Versatility is one trait that makes decorative concrete floors an ideal material. There is a broad range of coloring options available, each one offering a variety of colors that can be mixed and matched, depending on your preference. Custom designs and images can be incorporated on the surface of a slab to personalize it such as through decorative concrete stamping. Other add-ons, like scoring and engraving, can be done on a colored surface. Color – Obviously, slabs won’t be the plain gray surface it used to be after a coloring agent is added. There are many colors available, from earth tones to pastels. Most coloring methods allow customers to mix colors and create new, interesting ones. Design – Plain slabs can be colored to look like other materials. Skilled artisans can make the surface look like flagstone, slate, bluestone, or any other natural stone. Repair – Discoloration is one of the issues that property owners face. It could be something caused by something spilled or an effect of weather. Whichever it is, coloring concrete helps mask the ugly colors and make it more appealing. Affordable – Compared to decorating concrete with other materials, adding a coloring agent and doing some concrete polishing will yield as attractive results without requiring a huge investment. 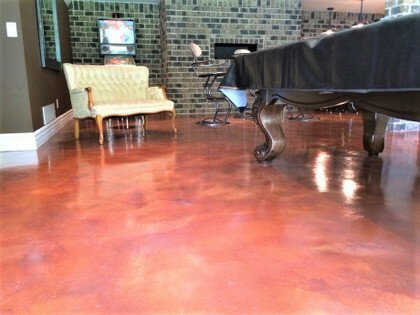 Concrete Staining– Of all the coloring methods, stained concrete is probably one of the most recommended. Acid stain concrete is known for the variegated, mottled look caused by the chemical reaction between the stain’s metallic salts and the slab’s lime and mineral content. Water-based create a uniform and consistent colors because it is non-reactive, making it perfect for custom logos and designs. Integral – This type of coloring method involves mixing the color into the concrete before it is poured and troweled. Because it is mixed in, the colors are less intense. This is often done on newly installed slabs. Dry-Shake – This powdered coloring agent is thrown and spread on a newly installed slab or overlay. The installer would often walk around the fresh slab and broadcast the powder as evenly as possible. Dye – This is similar to stains because it also comes in two types, one of which is also reactive and one nonreactive. This is not an ideal solution for covering up ugly stains and discoloration because it dries translucent. Get a free colored concrete consultation now. Call (317) 854-4529 today. Indianapolis Concrete Artisans is the most trusted and highly-rated decorative concrete company that creates custom colors and designs for indoor and outdoor concrete. We make sure that each project is done on budget and on the customer’s price point. Call or email for a free consultation and quote now!